SMISEAS External CD DVD Drive USB 3.0 Burner is convenient for you to play music, movies or install software with this slim portable external DVD drive, copy & burning music from your laptop to a CD disc in a flash. External cd dvd drive for laptop mac usb 3.0, give you high speed data transfer and better burning experience, more stable data transmission compatible with USB 2.0. Portable cd dvd +/-rw drive don't need external AC adapter. DVD rewriter external drive supports DOS Start and System Recovery. Brand new inport chip, correct errors, shockproof, low level noise. Route optimalizing design for power saving and low power consumption, no external power require. Unique intelligent replication technology, external cd dvd drive for laptop windows 10 is easy to Pause/ Record Files. Pure copper mesh is low impedance,data transfer is more stable. Slim portable lightweight cd dvd external drive is easy to carry whether at home or travelling. External usb slim dvd r/w drive is a data interface properly connected to USB port of computer, the computer display will appear device icon in lower right corner. Click on desktop, open"my computer", in "the mobile storage device should display the drive icon". Click on icon button, select "pop"in the tray into the appropriate disk read. Internal laser light is harmful! Don't put cd dvd drive in places subject to external pressure or nearby strong magnetic objects to ensure external cd drive burner works. Make sure laptop has a "Media Player". NO EXTRA DRIVE, PLUG ＆ PLAYExternal DVD drive is powered by the USB port. No driver and external power needed. Just plug the external CD drive into your USB port and the DVD driver will be detected. USB 3.0 DVD CD dirver external is a perfect companion for computers without the internal drive. Pop-up button and disc tray design make the external cd/dvd drive for laptop convenient to read or write CD DVD discs. 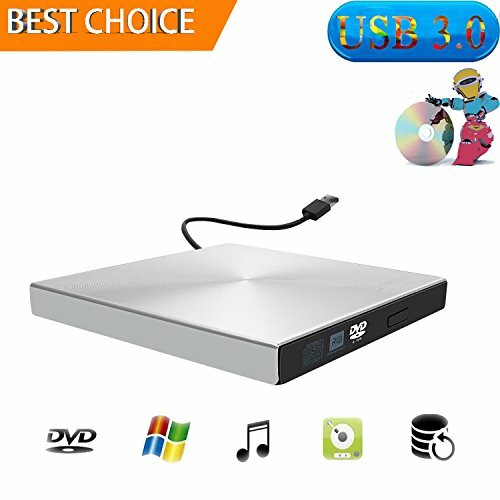 USB 3.0 HIGH SPEED INTERFACEExternal DVD CD RW optical drive with USB 3.0 provides you with faster speed data transfer and better burning experience.The external optical drive with USB 3.0 transfer is 10X speed of USB 2.0, which ups to a maximum of 5Gbps, and compatible with USB 2.0 and USB 1.0. Reading speed: DVD-ROM 8X,CD-ROM 24X. Writing Speed:DVD-R 8X,DVD+R 8X;DVD-RW 8X; CD-R 24X. The CD-RW drive supports CD-R, CD-ROM, CD-RW, DVD+R, DVD+RDL, DVD+RW, DVD-R, DVD-RAM,DVD-RDL,DVD-ROM,DVD-RW. HIGH PERFORMANCExternal DVD CD burner writer adopt intelligent burning tech, let read/write/burn disc or interrupt recording at ease and watch DVD movies, listen music, burn music/pictures/movies to CD/DVD. External CD drive feature strong error-correction ability, with anti-shock＆noise reduction tech, low power consumption, plays music/movies with no lag/distortion. Portable DVO CD rewriter use EAD voltage stability system to avoid voltage is too high/low caused by drive to damage laptop. ULTRA-SLIM＆FASHION DESIGNUltra thin compact DVD drive(detachable cable), is made of brushed texture shell bringing touch and sight enjoyment, enable the cable low impedance and anti-interference ability, low noise, anti-interference and high durability. Portable CD drive has a slim, lightweight and shockproof design and stylish enough appearance, it's convenient to use and carry this External CD Drive/DVD Writer/Player whether at home or travelling, which only need a little space in bag. WIDE COMPATIBILITY＆WARRANTYUSB 3.0 external cd dvd drive burner is compatible with Windows 10 / Windows 8.1/ Windows 7 / MAC / 2000 / XP / Vista, all Version MAC OS system. Support laptop, notebook, PC, desktop computer. For desktops, please connect high speed dvd cd drive to USB port on back of the motherboard for normal use. Portable slim external dvd cd drive burner adopts 100% durable brand new DVD loader is more stable. High quality with 12 months warranty, feel free to contact us. If you have any questions about this product by SMISEAS, contact us by completing and submitting the form below. If you are looking for a specif part number, please include it with your message.